Hoeg’s sense of tempo—The story is a first-person narrative, told by its protagonist, Smilla Qaaviqaaq Jaspersen, the 37 year-old daughter of a deceased Greenlandic Inuit hunter and her Danish doctor-explorer husband. 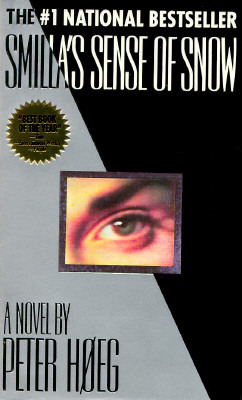 Who Smilla is, what her childhood was like, where and how she learned her extraordinary set of skills (like her “sense of snow” that allows her to recognize the death of her young neighbor and friend, Isaiah, was murder, not an accident), what her life and relationships are like now as she approaches middle-age…all these, as well as the multiple mysteries connecting Isaiah’s death to their native Greenland and the circumstances that brought her parents together in the first place, are revealed slowly, deliberately, like the exploration of an unknown darkened house by flashlight, or the piecing together of a jigsaw puzzle over days and weeks. Imagine Ravel’s “Bolero”, but slowly crescendoing for hours rather than just minutes. Hoeg’s painting of scenes—Smilla’s Sense Of Snow is divided into three sections: The City, The Ship and (briefly) The Ice. Within each section, the action takes place in a limited number of locations. Hoeg’s descriptive talents are such that the reader not only can visualize Smilla’s apartment, her father’s mansion, the docklands of Copenhagen, the rooms and spaces aboard the ship, but practically touch and smell them too. It’s a remarkably absorptive tale. He adds cream and several drops of orange juice to the soup. He warms French bread in the over and fills the pepper mill. I’ve stepped into the middle of the room to have more space. It’s rare that you have a chance to explain yourself to a fellow human being. Usually you have to fight for the floor. And this is important to me. I wind up standing in front of him.